So, the 7 x 5 LED matrix simply represent each band visually on the vertical axis. Since this is a digitally controlled pedal, there is only 1 big knob – or encoder, really – that is for dialing in how much you want to boost or cut each of the EQ bands. As an EQ naturally adds or subtracts gain, there is also a small knob right next to the large encoder that controls the master OUTPUT – perfect for dialing in unity gain. As a neat little extra feature this knob is clear and lights up blue with increased brightness as you turn it. You can cut or boost each band up to 18 dB, and the LEDs for each vertical row has several levels of brightness, so as you turn the encoder it takes a few ‘clicks’ before the LED light jumps up or down to the next indicator. In short, the resolution is much finer than what the 5 vertical LEDs might suggest at first. On either side of the matrix, there is an arrow button that you can use to move from band to band and in between them, there is a 6th row of smaller LEDs that indicate exactly which band you are tweaking. The Programmable EQ is also capable of storing up to 4 presets. On the upper left side of the pedal, you will find 4 old-school LEDs numbered 1-4, each representing a preset. Almost as expected, you simply save presets the old-fashioned car radio way, pressing and holding the SAVE button until the preset slot you currently use flashes. Then, the new setting is stored. Right next to the SAVE button is the SELECT button that lets you browse through the presets one by one. There is, however, an alternative – and quite clever – way to swap preset. As you may imagine, having to locate a tiny black button mid-song on a dark stage is not ideal. So, if you press and hold the foot switch, the pedal automatically moves through the presets from 1 to 4. Now you just have to let go of the footswitch when the preset you want is selected. Finally, you can access the BACK PAGE functions by pressing the LEFT ARROW and SAVE buttons simultaneously. Here, you can select the OCTAVE EXTENSION (the 62 Hz EQ band), and you definitely want to activate that for bass. You can also set the speed at which the presets switches when you use the press-and-hold-the-footswitch as described above, and there is an AUTO SCROLL function that allows you to use the same press-and-hold-footswitch trick for scrolling through the presets at a given speed (you can set the speed in here as well), rather than use it for preset selection. The pedal also has a MIDI port if you want to integrate to a larger MIDI-controlled effects and pedal setup, and in the back page mode, you can alter the MIDI settings as well. I will not delve deeper into this, but if you get your hands on this pedal, you may want to spend a little quality time with the manual. OK, I’m going to try something new here. All the reviews so far features a bunch of sound clips. Often I take a methodical approach, which asks for visuals on how the pedal is set for each sound clip. Therefore, I have to embed individual Soundcloud files with a photo of the pedal settings in question. Without getting too technical, too many of these instances on one webpage slows things down immensely, especially on older devices. When I set out to do the sound clips for this pedal, I realized that there could potentially be hundreds of examples, covering all EQ bands individually and in combination. Wouldn’t make sense and would take forever, too. So, I decided to take an alternative approach and create just one audio sample that includes 2 bars of muted playing, 2 bars of fingerstyle, 2 bars of slapping and 2 bars of muted picking. This sound clip is then used for demonstrating 10 different settings and instead of spreading them out on several sub pages, I decided to make a Soundcloud playlist on this page, and then name each of the sound clips in a way so that you would get an idea of how the pedal has been set (roughly). Anyways, this is the approach for this review. 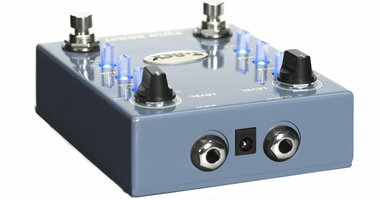 Let’ s get started and listen to the Source Audio Programmable EQ pedal. NOTE! Please use headphones or ‘real’ speakers. You simply can’t judge low-end material on laptop, tablet or phone speakers…! The rich feature set suggests a very high level of versatility, which is indeed the case. Having said that, I also found that there is a learning curve involved – especially if you delve into the back page settings and the MIDI side. But hey, you might just have to go there once to activate that 8th EQ band at 62 Hz and never worry about it again. The Auto Scroll feature is a fun idea and you could potentially create some fun tremolo-like effects and find meaningful musical applications for it, but as is always the case with time-based effects, either easy access to the time control or a tap tempo feature is often desirable. Further, say you experiment and find 4 presets that sound great when you auto scroll – then you would have used up all 4 preset slots on that one concept. So, in my book, the true value comes from using each preset for individual purposes. Should they happen to also sound great for auto scrolling (and it just might! ), then that’s great too, of course, but I would not make it the first thing to go for in this pedal. However, that doesn’t mean the SA 170 is not versatile as a sheer EQ pedal. On the contrary, it is very versatile indeed, and it sounds great too. One thing that does add a lot to the versatility side of things is the preset function also mentioned in connection with the auto scroll feature in the above. With 4 presets you could tailor tones for several different basses, or you could dial in a solo tone that changes the core tone as well as giving a slight boost in volume. Or you could allocate one of the presets to your core tone plus just a bit of emphasized mids. 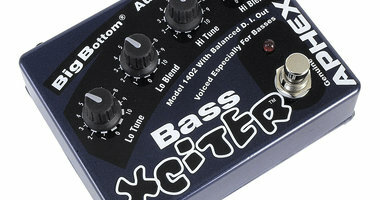 While such a tone may not be the most pleasant experience when you noodle around with the bass on your own, it can be a lifesaver in a busy band mix. Sometimes, you don’t need an overall volume boost to cut through, but just a small mid bump that will clear things up for you. I love feature-rich pedals, but also simplicity. This one is definitely strong in the feature department, but I like it even more for its clean and flexible tone-tweaking abilities, as well as the option to create presets. The quality appears to be quite good. Knobs and connectors feel firm. The only thing I noticed was the large encoder that has an ‘endless’ design with small tactile steps as you turn it. The balance was for the most part fine, but it didn’t have a super tight feeling to it. Having said that, I also realize that you would probably not want it to be as ‘tight’ as a toggle-style knob as you would often want to dial it like a regular step-less knob. Thinking about it, the compromise is actually quite good, and as long as it does the job, which it certainly does, I have no issues with it at all on a practical and functional level. As for the usability, aside from the sub-level of the back page mode, it is a pretty logically laid out pedal and most knobs are acting like you would expect without consulting the manual. One small issue is that when you activate the 8th EQ band, you still only have 7 vertical rows of LEDs, which means that once you hit the left arrow button to access the lowest register the visual ‘pattern’ of the LED matrix switches one step – and back again as you move up higher in the frequency spectrum. It did create a little confusion at first, but once I got my head around it, it was not a problem. 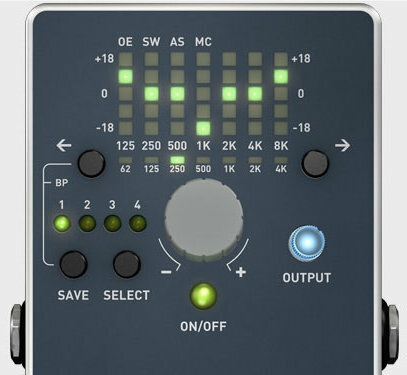 Today (2016), a new Programmable EQ retails at around $150. Considering the impressive feature set and sheer problem-solving qualities, as well as the great sound I find the value for money to be very good. Sure, a Boss GEB-7 graphic equalizer is about two thirds of the price, but you would then need 4 of them just to have the flexibility of the preset feature. 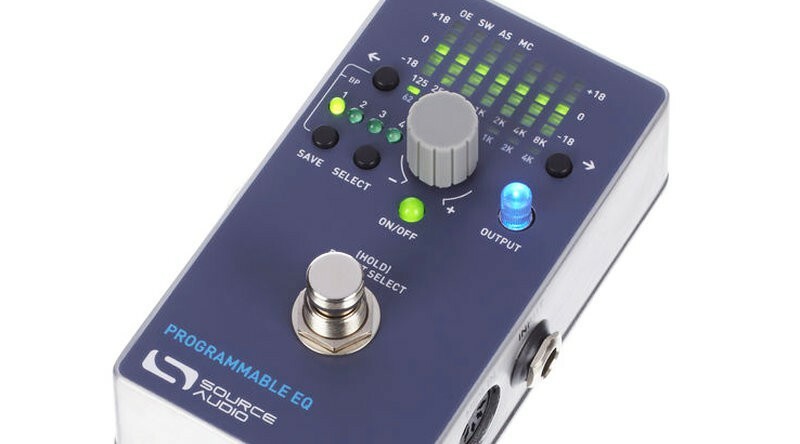 The Source Audio Programmable EQ is a great-sounding tone shaper and a flexible tool with 4 storable presets. I use it to create presets for my main Fender Jazz and Precision basses. The Jazz is on preset 1 and the Precision is on preset 3. Preset 2 and 4 are the same basic tones, but with slightly emphasized mids for additional cut-through-the-mix power. There are may other ways to use the preset feature of this pedal, of course, and the single most important thing to keep in mind is that it sounds great when you dial in tones. If that was not the case, presets wouldn’t matter a whole lot anyway. nice idea to have a 4 different playing styles in one soundclip! Thanks for the feedback. Yeah, will definitely consider doing this from time to time. You could have uploaded a photo of the eq settings on each sound sample! The way you named the samples are nice, but who knows what exact setting you meant exactly? Hi Gbaor. Thanks for your inout. And yes, I kind of agree with you. As mentioned in the review I am still debating myself whether this approach is the right one. I guess what you mean is that it could be a combination, and that is definitely also an option. In this specific case, though, the issue was also that even a photo of the setting would not have been precise as I have activated the Extended Octave (the 8th graphic EQ band) and the pedal only have visual representation of 7 bands at any one time. But I will definitely consider coming up with a combination if/when I have a pedal review where that would make sense. you are absolutely right, also there are more steps in each frequency than led segments, so there are still hidden areas in the settings, but still… music industry is all about visuality! Back to the previous subject, I think this type of demo is fine, more info in a more compact format.